Hello dear all hope you are well. Today I am featuring my favorite denim culottes from H&M. I can't tell you how comfy they are. They are so easy to style, the material is light-weight and is perfect for Delhi summers. Being high waist is a major plus point. I am currently obsessed with this piece. Here, I have worn it with a floral top which has been with me for ages and I still love it. So that's all for now. Till next time, bye. I love wearing culottes because they are so comfy! These pants are awesome! You rock with this look! Lovely details in this look. SO gorgeous. Loving this look from head to toe! The jeans are so cool and the top adds a nice softness to the outfit. Lovely all around! Such a beautiful top! The pattern is perfect! love those culottes! such a flattering cut! Such a great look love your style. Love how you paired the girly floral print with the frayed hem culottes. A great contrast. Always so stylish!! You wear it so well! Wow, your blog is amazing! Nice layout and photographs! 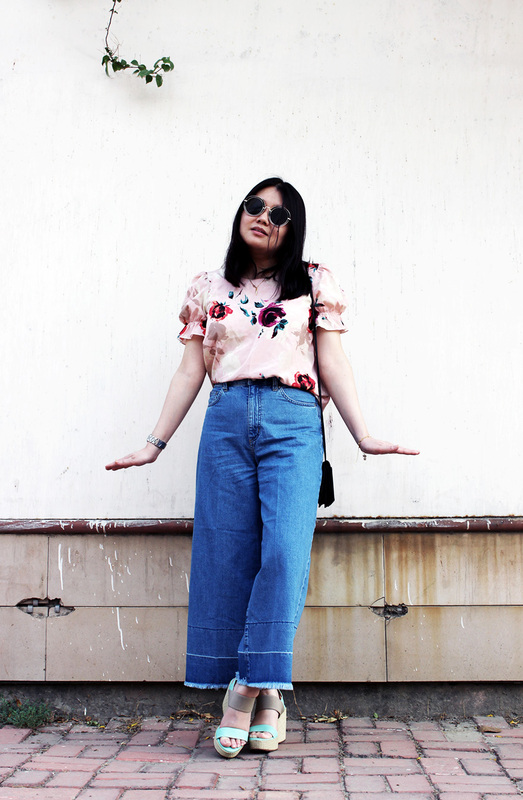 And of course, style in this post is georgeus, love the floral print and sunglasses! I love that floral top! super cute look! Girl I need those culottes!!! Definitely couldn't pull them off quite like that though! This outfit is dope! The floral top is beautiful! And the hem on the cullotes is just great! Beautiful outfit! The blouse and sandals are cool! Beautiful look dear! I love the denim Culottes! And the combo is great! I absolutely adore the way you've styled your denim culottes, so chic! The floral top is so pretty and I love those shoes, such great styling, beauty! Thanks for sharing and I hope you're having a great start to your week so far! Love your beautiful top!! Looks so lovely! Beautiful outfit! I like everything about this outfit!! I own a pair of culottes but they are fabric ones - I adore them! These denims look SO awesome on you!! I also adore the floral blouse you paired with the culottes... great ensemble, girly! !